It's been a while since my last blog but a lot has happened in that time. 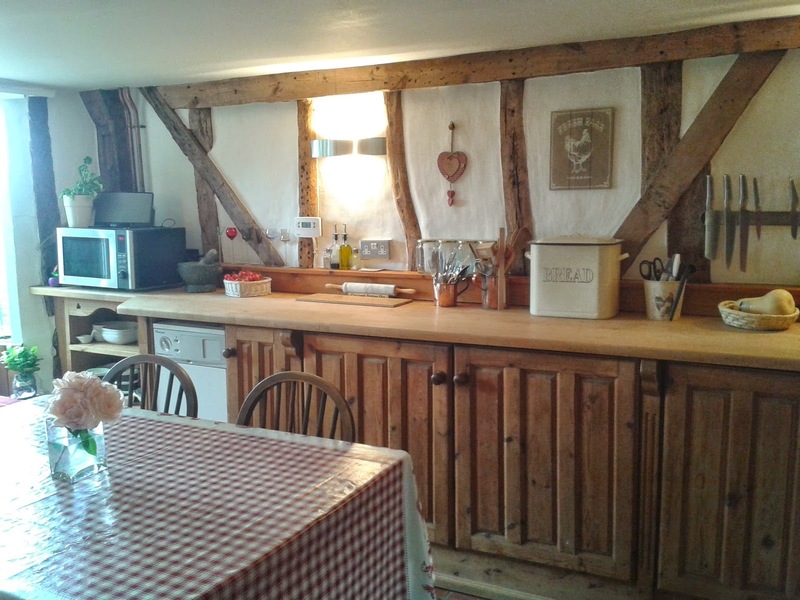 I've made a lot of changes most important of which is moving from a 1960's semi in the town to a 400 year old thatched cottage in the country - and I couldn't be happier! It was quite difficult getting in to the historical spirit to write about times gone by from my 1960's semi, decorated with lots of glass and black stuff in a contemporary minimalist style which showed every bit of dust and every finger print. However, I did have a lovely study built at the back of the house where I could look out on to the garden and watch the birds (and my cat trying to catch and eat them!). But it just didn't give me the inspiration I yearned for. The countryside had always been a dream for me, I spent many summers staying with aunties and uncles when I was a child (while my Mum and Dad were off holidaying to sunnier climes without me). I spent my time wandering through fields and cycling along country roads taking in the country scenes and visiting other relatives who lived within short distances. I loved hearing the stories of the old days and of family members long gone and the things they got up to. It was magical - well, apart from the time I was chased by a herd of cows and had to run for my life wearing a stupid pair of 1970's wedges, oh! and also the time when I picked a pretty looking plant which brought me out in blotchy spots and itchy swollen eyes and I was promptly sent to bed! The appeal of our beautiful 1960's semi where we had lived for 16 years perfecting every inch with the latest colours of paint, impractical furniture and impressive gadgets was fading. The dynamics of our neighbourhood was changing. The roads were becoming a racing track for young men in fast cars and the people were getting younger, the old ones were either dying off or being sent to nursing homes and these quiet, routine loving oldies were being replaced by young families with crying babies or party loving animals installing jacuzzis and playing loud music until the early hours, then there was the neighbour who got himself a new toy, a pressure washer which he felt necessary to use at 8am every Saturday and Sunday morning. 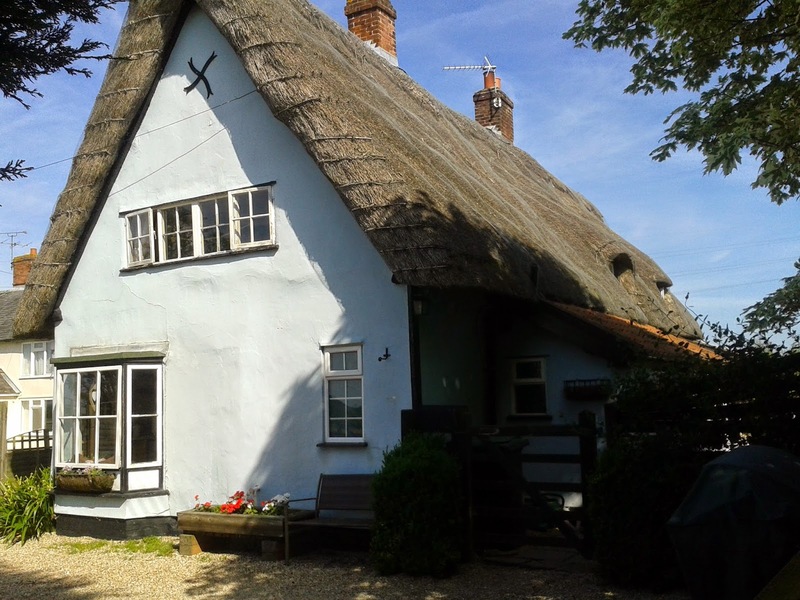 To escape it all I increasingly dragged my husband around the villages of Suffolk, on the pretext of looking into some family history or checking up on some information I had found out about a curious story, like the Groaning Stone at Debenham. We would pop in to country pubs and enjoy the views on summer days and sit by the roaring fires on cold days. We progressed our 'town loving' to 'country loving' metamorphosis by taking pub walks, later even forgoing the pubs! At Christmas and birthdays the family kitted my husband with country stuff like binoculars and hiking sticks and at last he was hooked! By the end of the Christmas holiday 2013, the Townie - 'always have been - always will be' was transformed. 'Should we move to the country?' he asked. But, we're here. The fast cars have been replaced by tractors, the pressure washer has been replaced by combine harvesters and birds nesting in our thatch. Our few neighbours are fantastic - we thought we may have to wait to be accepted (you hear the stories of having to wait 30 years to become one of them) but they are actually helping us settle in. So far I've had an old bush cut down, my path weeded and have been provided with the use of a compost heap. We've been taken to a hog roast (with karaoke) are getting advice on who to hire for strange new services like thatching and oil fired heating. We are even being given gifts - the best scotch eggs we've ever tasted and a huge bag full of fresh runner beans. The squeaky clean house we once owned has been replaced with a wonder of beams, wonky floors, (well, wonky everything - there's not one door that fits properly) creaks, cracks, uncleanable corners, a supply of invincible fleas left by the last owner's dog and dust, lots and lots of dust. But I now have lots of inspiration, everywhere I turn I feel there's a question needing to be answered. Why is that beam there? What's that funny looking hole going through it? Why have I got a window seat in my kitchen? Why is there half a beam running through my landing bedroom? I was also given a box of deeds with the house which I have started to go through and investigate. And, the neighbours have told me stories about the house, apparently part of it was once used as a dissenters chapel and a school and the part I'm living in was at one time two cottages. Then there are the stories of the three ghosts. I can't wait to get started.